Very Good. The New York Times bestselling account of a thrilling real-life journey into deepest cave on earth. 320 p.
Very Good. 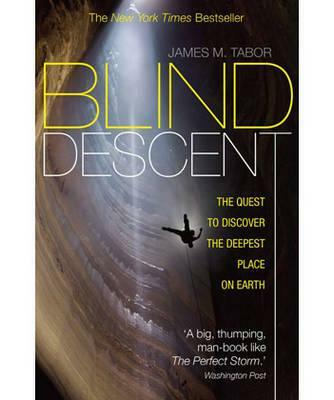 Blind Descent: The Quest to Discover the Deepest Place on Earth by Tabor, James M. Sewn binding. Cloth over boards. With dust jacket. 286 p. Contains: Illustrations. New. 2011. Paperback. The New York Times bestselling account of a thrilling real-life journey into deepest cave on earth. Num Pages: 320 pages. BIC Classification: BTP; WSZN; WTLP. Category: (G) General (US: Trade). Dimension: 197 x 127 x 24. Weight in Grams: 288. The Quest to Discover the Deepest Place on Earth. 320 pages. The deepest cave on earth was a prize that had remained unclaimed for centuries, long after every other ultimate discovery had been made. This is the story of the men and women who risked everything to find it, earning their place in history beside the likes of Peary, Amundsen, Hillary, and Armstrong. Cateogry: (G) General (US: Trade). BIC Classification: BTP; WSZN; WTLP. Dimension: 197 x 127 x 24. Weight: 282......We ship daily from our Bookshop. The story describes not only the efforts to achieve the bottom of the world, but also the personalities it toook to make the effort. I think the end of the book is only temporary. The world is big enough and so much of it is not readily visible, that I think the exploring of caves will go on, to the delight of future readers. Someday somebody might dig through another port or opening to discover an opening that smashes all previous efforts to get deeper. Only the thickness of the earths crust and the water level of the ocean and major seas limits the search for the deepest pit on earth. Really really enjoyed getting to know the personalities of the people striving against water, muck, rock, and bad air to get deeper and deeper.